He is a real Human interest story. 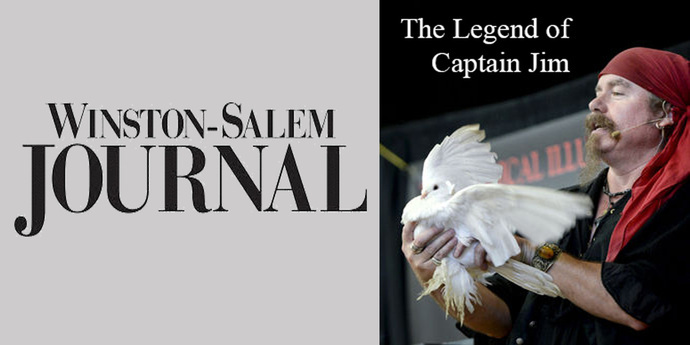 Captain Jim has been featured in many News articles, TV & Radio. Many other Towns & Cites that he has performed in! A good magician never reveals his secrets, but one of Light’s is clear: Perseverance. After an automobile struck him on his motorcycle which claimed the lower portion of his right leg, Light adopted the persona of Captain Jim, becoming a pirate magician and a hidden gem — or, in his case, the entire pirate treasure chest — of a party and event performer. “All those who have seen him perform clamor to get him for their next event. For those who don’t know about him, they’re missing out,” said Debbie Shively Wilborn of Summerfield. After his debilitating accident in June 2000, Light shut down his construction company. She said Light’s show is spellbinding for audiences of all ages. Light weaves humor and motivation into his shows in the hopes of sharing what he has learned from his accident. He lives his life by the poem “The Winner,” author unknown, which he first read as a child and has the poem hanging in his house to this day. While most would think of a motorcycle accident and an amputation not as a good thing, Light said it gave him the courage to pursue his passion and the opportunity to test his resilience. Now, Light performs not just as a pirate but other characters as well as in casual and formal attire. Jim Light, aka Captain Jim, has made lemonade from lemons after a motorcycle accident, due to a automobile running into Light, which led to a partial amputation of his right leg in June 2000. After recuperating, Light's career in magic stared in 2002 as a pirate, complete with a peg leg prosthetic. Magic with motivation on how you can get through your troubled waters. Now, he performs in casual, formal & character attire. Light said, "As a child I enjoyed entertaining others with magic and whimsical sketches. It was in my blood from the beginning, I guess? It was the life changing loss of my leg where I came up with the character such as a peg legged pirate. That alone with incorporating my childhood endeavors created a wonderful career."